A great invention from Vegtrug. 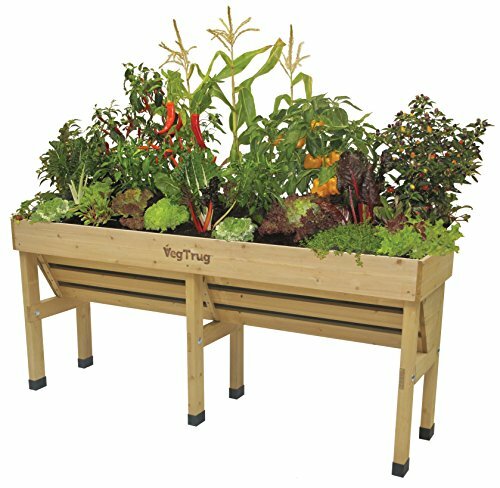 The medium Vegtrug wooden patio planter wall Hugger is ideal for narrow spaces where growing vegetable is not normally an option. Perfect for placing in front of a wall or a fence & can be used for vertical growing. The' are covered to protect wood & a pre-formed liner included keeping in the compost in yet allowing for good draining. At 78cm the working height is comfortable; no bending required making it perfect for wheelchair access. It requires 310Ltrs of compost to fill. All of your produce is raised so is kept away from slugs & animals/pets. Comes delivered flat packed & with the easy to follow instructions makes it easy to assemble.